The Residential Curriculum Institute outlines 10 “Essential Elements” that make up a curriculum and yet little to no research has been conducted specifically on these Elements. While that is not to say that the Elements are unsupported by research, they borrow from proven concepts and sound principles of instructional design, but there is currently no body of research that supports why an Element should be a part of a residential curriculum specifically or why these elements are all “essential.” This begs the question, are there additional Elements that should be included? If additional elements are to be added, an important “eleventh element” may be the concept of customized student learning. One of the hallmarks of a curricular approach is that it moves beyond the “one size fits all” approach of programming towards more intentional and individualized student learning experiences. This is one of the reasons why intentional interactions (sometimes referred to as resident conversations, or intentional conversations), are so often key features of a curricular model. These one-on-one opportunities allow students greater voice and options in choosing their own learning. Trends towards customized student learning can also be seen in shifts throughout higher education as a whole. As a result of demands for educational accountability and the rise of new enabling technologies, learning is becoming more tailored to the individual student’s needs and goals. For example, the rise of on-going training and education programs through certificates, micro-courses, and online coursework allow students to learn without the constraints of monolithic degree requirements and traditional 15 week classes. Furthermore, education can be sought in places other than the traditional classroom–through apps, online educational resources, and learning networks developed on social media. The transformation is a part of a shift from “teacher centric” models of education to “peer-to-peer” models of education. Traditional paradigms of education often place the teacher at the center of the learning process. As a lecturer, or the “sage on the stage,” the teacher possesses knowledge and provides it to students. This can be seen in many of the traditional approaches to residence life that employ programmed events with speakers or authorities providing information. Peer-to-peer models are more common to experiential education programs and are often discussed as they relate to technology. These more “modern” approaches to education utilize peer interaction, discussion, and activities to make learning more tangible and “hands on.” The traditional lines between teacher and student are blurred and everyone is viewed as possessing and contributing to the group construction of knowledge. Customized learning allows each resident to set and pursue their own learning goals with the help and guidance of peer leaders (resident and community assistants) and student affairs and residence life professionals. The role of the staff more often becomes that of a guide. Pairing students’ individual goals with the knowledge and skills that research tells us that students need produces an educational experience that balances the needs and desires of students with the goals and outcomes of the institution. In many ways, this line of thinking is akin to Marcia Baxter Magolda’s “Learning Partnerships Model.” A model that is already in use at many institutions that utilize a curricular approach. 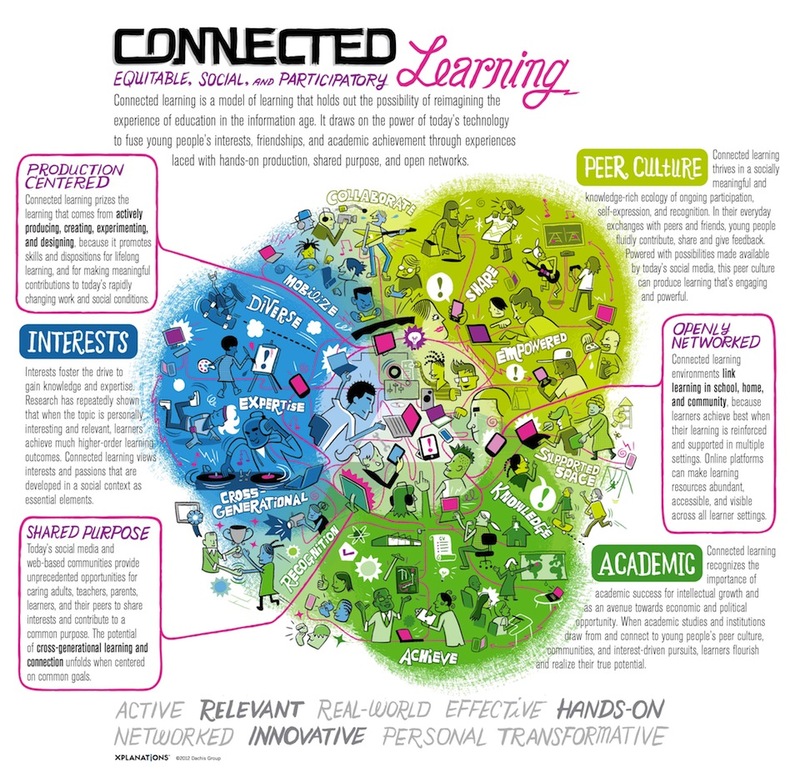 The following infographic, courtesy of the Connected Learning Research Network and Digital Media & Learning Research Hub, provides an overview of how this learning paradigm is different. Credit: Connected Learning Research Network and Digital Media & Learning Research Hub. Creative Commons License This Connected Learning Infographic is licensed under a Creative Commons Attribution 3.0 Unported License. You may Share and Adapt it, but you must give appropriate credit, provide a link to the license, and indicate if changes were made. Perhaps an “eleventh essential element” for a residential curriculum includes the notion that learning is a partnership, that learning should be customized, and that connected peer-to-peer learning (and the facilitation of that style of learning) is an important goal. A key change in philosophy when one moves towards a curricular approach is that programming is not necessarily the only approach to student learning. Learning can occur through the use of a number of strategies. Adding an element that speaks to the way learning should be facilitated explains the rationale and paradigmatic change one must create in order to be successful with a residential curriculum. How can you support customized learning approaches for your students? When is the teacher-centric model more appropriate and when might the peer-to-peer model be more appropriate? How can you best select and train staff members that can support student peer learning? How might your staffing models need to change?